Moonlight Over Paris is the latest novel from Jennifer Robson (which, coincidentally, would have been my name as well had I married my university crush). After almost dying from scarlet fever and having her fiancé break off their engagement, Lady Helena Parr makes the decision to move to Paris for a year to pursue her dream of studying art. During this year, she is able to escape her past and any lingering gossip, and she makes new friends, discovers new passions, and falls in love with a man who could possibly be quite unsuitable. 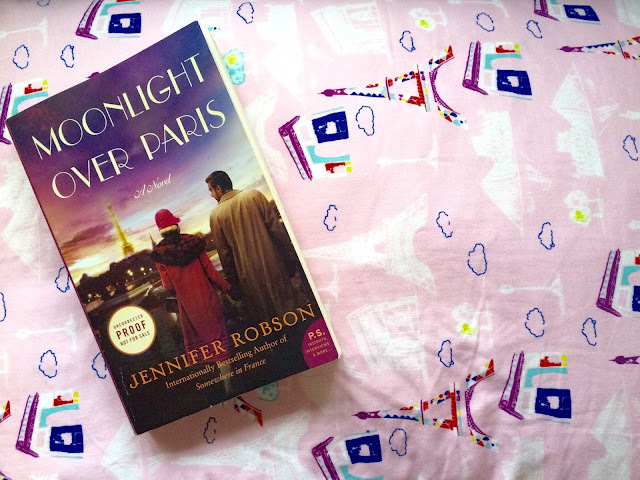 Moonlight Over Paris is historical fiction meeting a coming of age story crossed with a love story. What first drew me to this book was its beautiful cover. The colours, image, font, and title pulled me in, and I fell in love with the book before even opening it up. I enjoyed the story and the author's writing style. It's been awhile since I've read historical fiction, and I had forgotten how much I really enjoy this genre of books. I loved Helena Parr's character. She shows a lot of courage and through missteps and bold moves, she grows to discover herself and create the life she's always wanted to live. The book is also very descriptive, and I could easily visualize the art, fashion, and markets in Paris. This is one book you can judge by its cover! As soon as I finished Moonlight Over Paris, I immediately ordered her other two books to read next: Somewhere in France and After the War is Over. If you do pick up one Jennifer Robson's books, be sure to request a free, signed and personalized book plate from her website, or you can send her a message on Facebook. She is also willing to visit book club meetings via Skype which is pretty cool. I'd love to do that with my book club later this year! 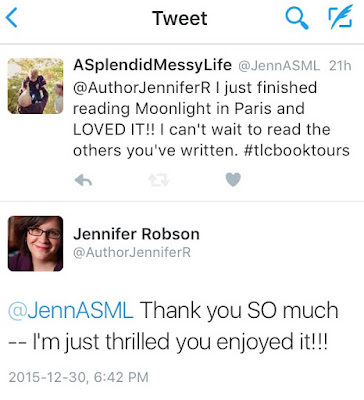 Jennifer Robson is the USA Today and #1 Toronto Globe & Mail bestselling author of Somewhere in France. She holds a doctorate in British economic and social history from Saint Antony’s College, University of Oxford, where she was a Commonwealth Scholar and an SSHRC Doctoral Fellow. She lives in Toronto, Canada, with her husband and young children. Find out more about Jennifer at her website, and connect with her on Facebook and Twitter. Disclaimer - I received a copy of this book from TLC Book Tours in exchange for my review. All thoughts, opinions, and Paris-related obsessions are entirely my own. One of the things I found most difficult during my miscarriages was how to talk to my friends and family about what was going on. I saw a social worker who helped me write this email to my friends and family which gave me the language I needed to share what I was feeling. I was extremely nervous about sending this email to my friends. I didn't want to seem needy and selfish. However, many of my friends told me afterwards that they had found it so helpful for me to explain exactly how I was feeling and how they could help. They wanted to show their support and didn't always feel they knew the right things to say. Please feel free to use and/or adapt this email in any way if it would be helpful to you. 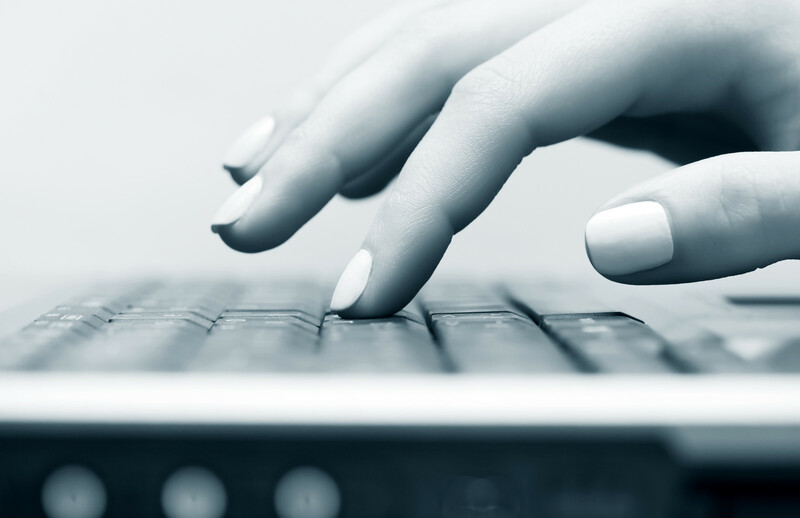 We are writing this letter to let you know how we are doing and a bit about what we are going through. You may know that for about a year we have been trying to start a family, and unfortunately have had two miscarriages, one of which resulted in an emergency surgery to remove the pregnancy. We have started seeing a fertility specialist and are having many tests. In June we will find out more, and a plan for our next pregnancy will be put into place at that time. We are deeply grateful for your love and support during this difficult and emotional time. We know it can be difficult to know what to say to us while we struggle with this, so we wanted to let you know what we would find so helpful. We also wanted to give you an idea of what you can expect to see from us while we are trying so hard to conceive. We have seen the counsellor at our clinic, who assures us our emotional reactions are absolutely normal for miscarriage patients. Many people having trouble getting or staying pregnant find this to be one the most difficult experiences of their whole lives. Our counsellor tells us that it’s quite common for a couple going through this to need to “cocoon” sometimes, and avoid certain events. You may see us less than you’re used to at these gatherings for the next few months. If we do attend, we may leave early. Sometimes these events are just too painful, and other times we may be exhausted from testing at the clinic. Please continue to invite us, but know we may decline. Please don’t take our absence personally! We love you, and we love your children, and we look forward to long, warm relationships with you and your kids. We won’t always need this kind of space…but right now we do. We will be back! Generally, it would be most helpful to us if you wait for us to bring up the topic. If we tell you that we’ve had more bad news, what feels the most supportive is to hear you say something like, “I’m so sorry you’re going through this,” or just say nothing and give us a hug. If you become pregnant, we will be so happy for you – and it would be easiest to hear your joyful news via email (because Jenn might cry!). We want to share your happiness, but it can make us feel sad for what we don’t yet have and yearn for so much. If you are having an uncomfortable pregnancy, it’s probably best if you share these difficulties with other friends and not us (at this point, anyway). If you have any questions, please feel free to ask either of us, or send us an email. It won’t make us feel worse if you talk to us about our struggle. It would be best to talk to us in private, in person or by email or phone, instead of a public place such as a restaurant or the subway. We are so lucky to have a support system like you, and hope this letter explains somewhat the situation we are in and how you can help us. Your love and support are treasured more than you know. Thank you for caring for us. I love tea. Maybe it's my English roots. I have a cup almost as soon as I wake up. It's my little morning ritual. A hot cup of tea can calm me down almost instantly when I'm feeling stressed. A hot cup of tea while reading a book is my happy place. I mostly love black teas. English Breakfast. Earl Grey. Black tea with vanilla. Add a little milk and a spoonful of sugar. It's delicious to me. Almost more important than the tea is the mug. Between Chapters and Starbucks, I can't seem to stop buying new, beautiful mugs. And now I have more than one favourite. Mindy Lahiri said that "a best friend isn't a person, it's a tier." Well, the same philosophy could be applied to my tea mugs. I probably have more pictures of mugs and teacups on my Instagram account than I do selfies. My most recent addition is the Best Day Ever mug from Starbucks that I received as a Christmas gift. I can't be not happy when I drink from that mug. Plus it makes taking my tea "to go" so much fancier. 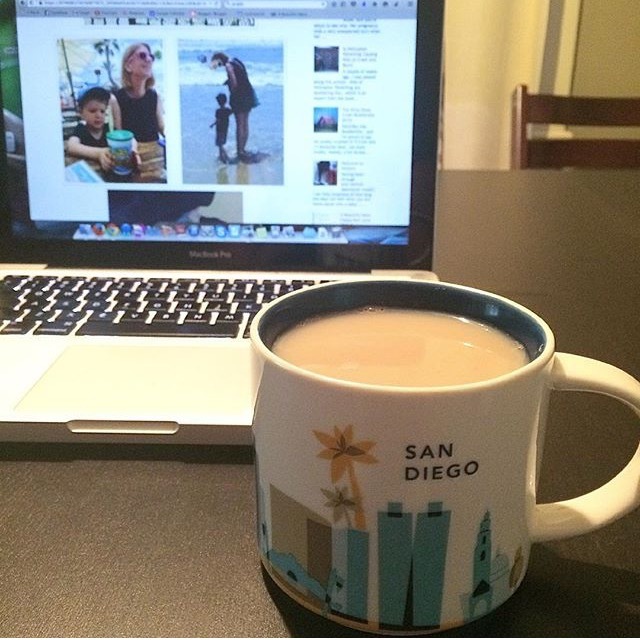 Last summer, I bought a San Diego mug from Starbucks' You Are Here collection. You can't really see it in the photo, but it's back there. I love this one so so much because it always reminds me of the amazing family vacation we had there in June. We played at the beach, visited the zoo, had delicious dinners. And using this mug reminds me of those really happy memories. I really love the "but first, Tea" mug from Chapters as well. There are so many "but first, coffee" mugs that I was dying for a tea version. There was no way I could leave this in the store when I saw it. The yellow floral teacup I don't use often, but it holds a special place in my heart. This teacup belonged to my grandmother and is from her collection. She passed away shortly after I got married, and I love this mug because every time it catches my eye, I remember her. I remember how she used to always love gifting my sister and I the latest Disney VHS at Christmas. I remember her visits and when she would travel with us. I remember her loving smile and how proud she was of her family. The unassuming, yellow, floral teacup is powerful. I even use this mug in my bathroom to hold all of my lipglosses! My sister bought it for me for my birthday after she and my mom took a special trip to LA together. 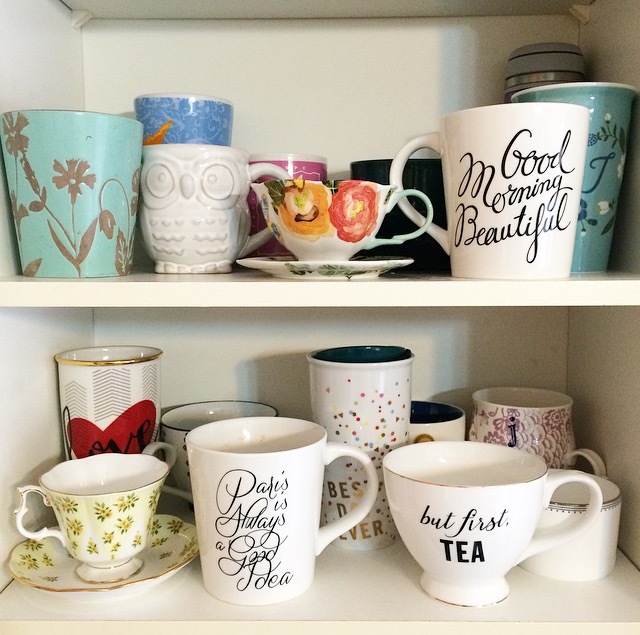 Within my beautiful collection, there are two mugs I am drawn to over and over again. The turquoise, floral mug and my Paris mug. Tea just seems to taste better in them. When I think about it now, those two mugs have been with me at some of my highest and lowest moments. I bought the turquoise mug shortly after Rob and I moved in together. Lots of wedding planning happened over that mug. That was the mug that caught more than a few tears during my miscarriages. But it was also the mug that I drank a lot of decaf tea in during my pregnancy with Sebastian. The Paris is a good idea mug is one of my all-time favourites. If you've ever purchased one of these giant Chapters mugs, you know what I'm talking about. 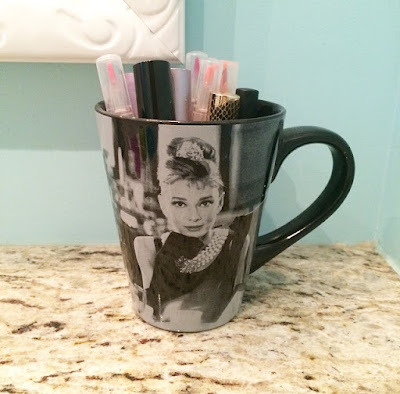 Not only is the Audrey Hepburn quotation on the mug very on point (I may also have a thing for Audrey Hepburn), but this mug holds a ton of tea and is perfect for early mornings. This mug has sat beside me on late work nights, and risen with me when Sebastian declares it "wake up time, Mommy". 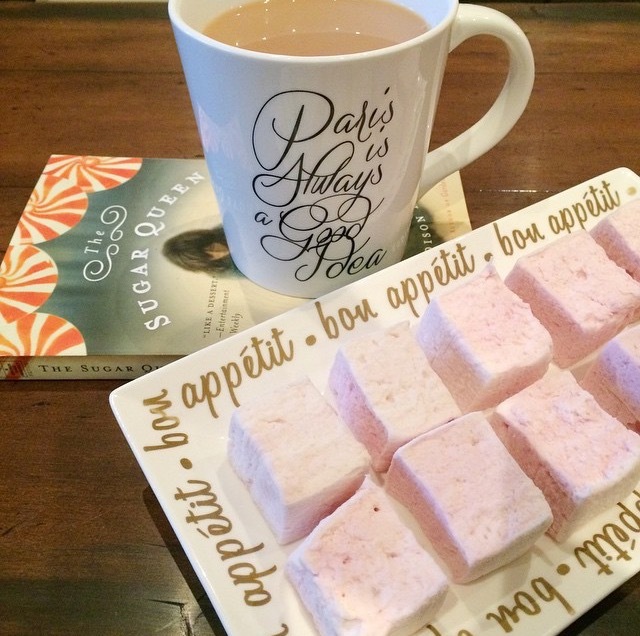 All of my mugs have sat with me while I've read the latest book I'm devouring. So, I continue to buy and love these gorgeous mugs. Even if I don't really "need" anymore. It's a small way to add joy to my day, something of which we can always use a little bit more. And these mugs start to really hold not just tea. They hold memories and stories from my life. 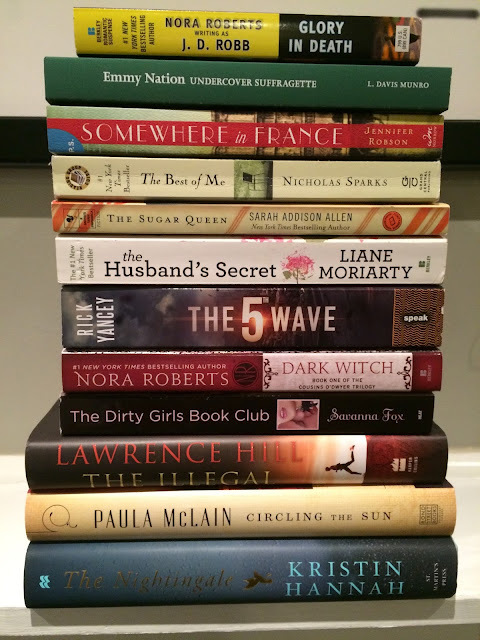 The 50 Book Pledge .... Am I Crazy?? 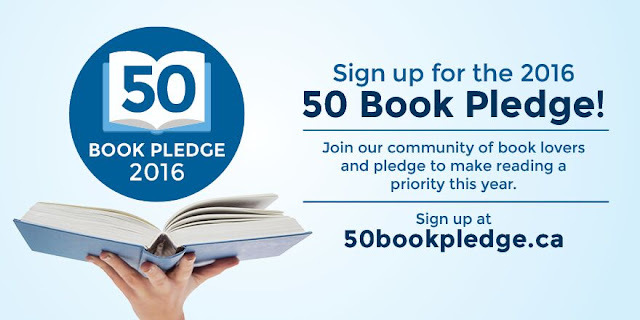 January 1st I signed up for the 50 Book Pledge. The concept is simple, you try and read 50 books in one calendar year. Last year I attempted the Read Harder Challenge, and I didn't do too bad. I read 21 of the 24 book. I'm still calling it a win. Even if I didn't complete all 24 books, The Read Harder Challenge definitely encouraged me to read books I probably wouldn't have otherwise picked up. Plus it introduced me to new authors, which is what kind of made me veer off the my 24 book plan by the end of the year. Also in 2015, I started working with publishers and book tour companies to participate in online book tours for new books. This is something I've really enjoyed and hope to continue. Between the Read Harder Challenge and book reviews, I ended up with so many books on my bookshelf that I picked up last year, and didn't read yet. So, this year I just want to read those books. All of the books that I put on my "to read" list over the last little while. I have no idea if I'll get to 50 by the end of the year. Even for me, that feels very ambitious, but it will be fun to try. I won't blog reviews about all 50 books, but I will try and keep my Books page updated with my favourites. At the end of the year, I'll put together a post with a list of all the books I read this year, and we'll see how far I got. Just like last year, even if I only get to 70%, that's totally fine by me. This Globe and Mail article says it's better for your health anyways. "With the 70-per-cent rule, the focus is not on maximizing returns but on achieving reasonable goals, with well-being top of mind." Perfect. I finished The Choice by Nicholas Sparks already this year and am now into The 5th Wave by Rick Yancey. Here's a sample of what's on my bookshelf for the year! So, am I totally crazy? Probably a little. Do you have any reading goals this year? What is something your wife always says to you? - She starts a lot of sentences with "So, I was thinking..."
What makes your wife happy? - Crossing things off her to do list. What makes your wife sad? - Finishing a Netflix marathon. How does your wife make you laugh? - By sneaking me to do lists. Hehehe. That actually makes me laugh. What is her favourite thing to do? - Have some quiet time to read. What does your wife do when you're not around? - Shops online. Yes! Take me to Paris. That's part of the reason I married a programmer. What makes you proud of your wife? - I'm proud of how she got into blogging and self-taught herself different aspects like giveaways, professional-looking banners, and networking groups. What do you and your wife do together? - Netlix marathons of 90s teen dramas. Negotiate with Sebastian. If she was a Disney character, who would she be? - Princess Anna. She was a pretty determined character. Can you tell we've watched Frozen about 15 times this week? How are you and your wife the same? We both like family, we're both frugal. We both like to veg after long days. We can both be OCD but about different things. Frugal? Sure, I'll go with that. And not remind him about the "shops online" question earlier. How are you different? - She doesn't have a lot of patience for technical issues. She doesn't have interests in the same dry, academic topics I do. Especially if it's inside a Chapters. 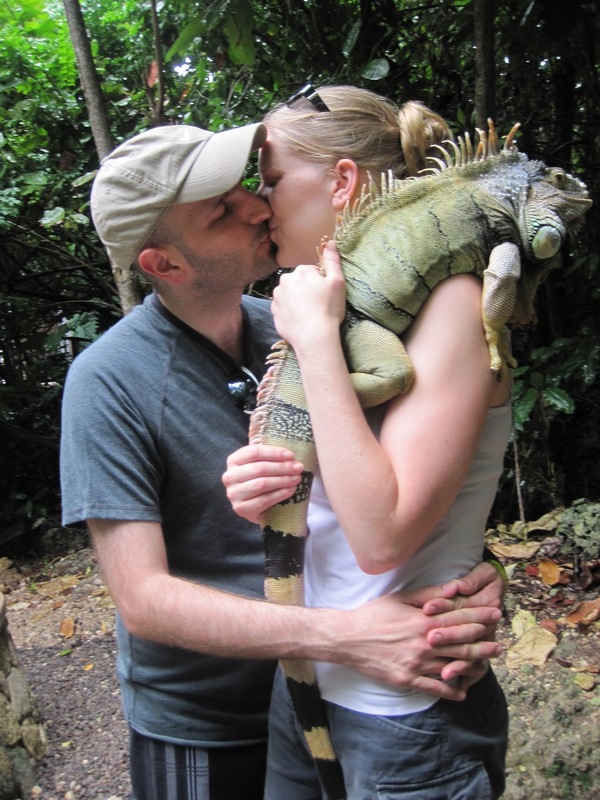 How do you know your wife loves you? - She takes care of me. I'm printing this out and taping it to the mirror in our bedroom.